Cornelius is a 7 month old bull terrier puppy who is ready for his new home. He is doing well with the other dogs in his foster home, but no cats or small furries for Cornelius! 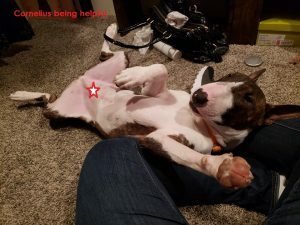 To adopt Cornelius, please visit our website – www.texasbullterrier.org – click on the Rescue tab for the online application form. I would love to adopt him!